Straight away, place a handful of dried mandarin peel into a small bowl and cover with water, allowing the peel to soak for at least 10 minutes. Then, tackle your sauce. Squeeze the juice of 3 mandarins into a large bowl, along with the barbecue sauce, ketchup, sugar and the juice from half a lime. Finally, add the water from the bowl of soaked mandarin peel, and mix. Keep hold of one of the pieces of re-hydrated peel, leaving it in the bowl of sauce to infuse it with flavour, and discard the rest. At this point, taste the sauce to ensure a balance of sweet, sour and savoury, adding more of any ingredient if required. Now, prepare your vegetables. Finely slice half a red onion, as well as 2 cloves of peeled garlic, before then cutting your ginger into thin matchsticks. On a large plate, begin to build your wok clock by placing the sliced red onion at 12 o’clock, and arranging the ginger and garlic, together, at 1 o’clock. Leave to one side to be completed later. Now, marinade your chicken by adding approximately 1 tbsp light soy sauce and a drizzle of sesame oil to the bowl, and massaging it thoroughly into the chicken. Then crack an egg into the bowl, and roll it around the protein, ensuring all pieces are well coated. (If using tofu, you will need to be more delicate. Do not massage the marinade in, but rather turn the tofu gently through the sauce and egg). Next, fill a large mixing bowl with the cornflour, and season it with the salt and pepper. Piece by piece add your chicken to the bowl, using your hands to cover all sides in cornflour until your chicken looks dusty white in colour, and then transfer the battered chicken to a clean plate, dusting off any excess flour before you do so. Time to get cooking! Set up your station! Line a large bowl with paper towels, and stand it to the side of your hob. Half fill your wok with vegetable oil and, over a high heat, bring it to 180C (350F). Test the temperature of the oil by placing the tip of a wooden implement, such as a skewer or chopstick into the oil: if the wood starts to fizz after a second or so, the oil has reached 180C and you’re ready to fry! Carefully introduce the chicken to the oil, one by one, and leave to deep-fry for 3-5 minutes until golden brown, turning the heat right up for the last 30 seconds to ensure a nice crispy finish (if using tofu, fry for only 2-3 minutes). Then, using a bird’s nest or slotted spoon, remove the chicken from the oil and place immediately in the lined bowl to the side, before also draining and cleaning your wok. Finish off your wok clock! With the sliced red onion at 12 o’clock, and the prepared garlic and ginger at 1, place the bowl of sauce and bowl of deep-fried chicken clockwise around the rest of the plate. Place your newly clean wok back over a high heat, adding approximately 1 tsp of oil and heating until smoking point. Introduce the onions and stir-fry until lightly browned, then add both the garlic and ginger and stir-fry for a further minute. Again, heat the wok until it reaches smoking point and pour in the sauce, keeping up the high heat to bring the sauce to a boil, approximately 1 minute. 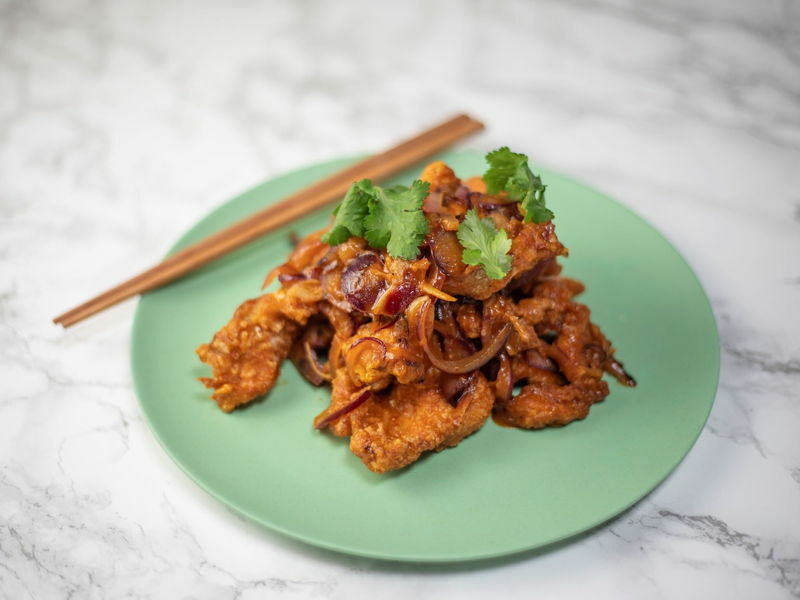 Finally, add in your chicken: give it only 5 tosses through the sauce, or a quick stir, to ensure the meat is covered in hot sauce, before immediately transferring the contents of the wok to a serving plate. Garnish with coriander, if desired, and serve alongside steamed rice. Enjoy!